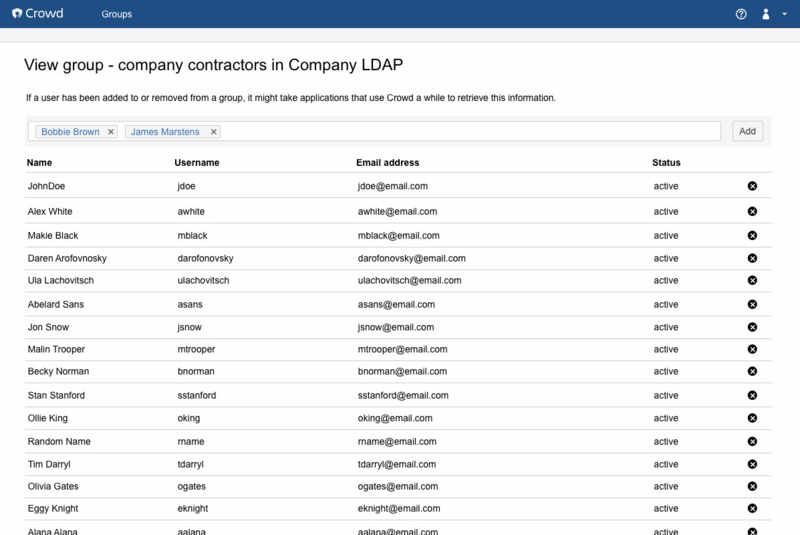 Starting from version 3.3, Crowd Data Center allows administrators to delegate some of their responsibilities over groups with Group Level Admins. Group Level Admins have rights to manage members of the groups they were allowed to administer. This also include groups and their members that are not in the same directories as Group Level Admins. Group Level Administrators can add users to groups and remove them from groups. Group Level Administrators can't create new users nor can they delete users. Changes made by Group Level Administrators might take extra time to be reflected in the applications. Group-level administration rights are can be given by only by Crowd administrators and they can be assigned both to individual users as well as groups. Once logged in as a Group Level Administrator, in the Groups section you're able to see all the groups you can manage. Click on the group name, to see a list of all group members.